I like your comparison of the asteroid "rubble pile" to our solar system. I think that before we talk about planetary orbits, and the forces holding the solar system together, we should understand what is holding the asteroid "rubble pile" together. Obviously, it is not gravitational force that is holding the asteroid fragments together. Even the mainstream agrees with that. But it would be a also be a mistake to simply try and substitute any other forces BETWEEN the "pieces", to try and explain the behavior we are seeing. We know that if we fire a single charged particle nearly along some background magnetic field, it will spiral along that background field. Fire a second like charged particle, and it spirals on a similar path. This is without ANY forces between the two particles. Sure, if we fire our particles together,we can have gravitational forces, electrostatic forces, charge exchange, etc, all working to keep the "pieces" together, but the point is, each "piece" will spiral along the same path even without any help from the others. Even if the asteroid was not spinning initially, when it fragments, we have electrostatic repulsion between the parts. This pushes the individual pieces of the asteroid out across the magnetic field lines. This causes the individual pieces to spiral around the magnetic field lines. A charged object traveling along a significant background magnetic field must fragment into pieces which spiral around that background magnetic field. The irony here, is that it is the electrostatic repulsion between the pieces, that drives the spin of the pieces around the magnetic field. It is not the gravitational attractive forces that cause the objects to spin around each other. These ideas will be important, when you consider that the Earth is moving slowly AWAY from the sun, and the moon is moving slowly AWAY from the Earth right now. celeste wrote: I think that before we talk about planetary orbits, and the forces holding the solar system together, we should understand what is holding the asteroid "rubble pile" together. Back in high school when I worked in a supermarket, I always dreaded the "spill on aisle..." calls. Some spills could be very messy, like tomato sauce. A peanut butter spill was never a problem. The then-new plastic jars would just bounce, but even the glass jars were easy to clean up. The jar would hit the floor and shatter into hundreds of tiny shards—yet stay all in one place like a car windshield. Oh, there might be a few tiny shards immediately nearby, but a dust pan collected those easily enough. So I think mainstream astronomy is overlooking a possible solution just because it is everyday. Although dark matter and peanut butter do make a tasty combination. Especially that Lindt 90% dark matter. That makes a lot of sense, thought provoking. I may have some questions later. Thermal images and the orbital drift of asteroid 1950 DA were studied to calculate the thermal inertia and bulk density. Findings prove that the asteroid body rotates faster than the breakup limit for its density, and that interparticle cohesive forces, called van der Waals forces, are keeping the asteroid from flying apart. They say that the equator rotates so fast that there is negative gravity there, and an astronaut would fly away. As an EU person I suggest that this is the answer: the asteroid is way more massive than they think and hence has enough gravity to hold together in its local space. The idea of Van der Waals forces holding it together is pathetic and very funny. ("Van" means "Count" in Dutch). Recent engineering has managed to clone Van der Waals tech, same tech used by Geckos to stick to ceilings, by making fiber tendrils with diameters in the nano-meter range: fine hairs to connect one body with another. In my opinion there is no chance at all this can occur asteroids or comets (same things). We get to test this theory right now because the ESA Rosetta probe is now at comet 67P and is now measuring its exact local spacial gravity (and apparent mass) by flying at it in straight lines comprising a triangular 'orbit'. As it flies by, the attemped straight lines are being bent by the gravity of 67P. After enough of that they will be able to calculate its local gravity well enough to shut off their thrusters and go into a real circular orbit. THEN we will get to compare the gravity, mass and density with what astronomers thought they were before arriving. Also, if they really were certain of their predictions, why the triangular 'orbit' testing period? Why not just go right into orbit? Answer: the spaceship drivers already know there is a fly in the astronomers' ointment. 4realScience wrote: ("Van" means "Count" in Dutch). It means "From" the name "van der waals" relates to the river "Waal". any such forces to stay together. Low density is more likely an indication of electrical activity than it is of porosity. Since Electric Universe theory sees asteroids as the result of planetary discharges blasting material into space, then it stands to reason that they have a lot more structural integrity than the mainstream presupposes. Their ideas arise from nebular condensation, and asteroids that are the remains of unconsolidated bodies that are loosely conglomerated. Needs to be merged with this one. Last edited by nick c on Fri Aug 15, 2014 8:25 am, edited 1 time in total. A study in 2003 suggested that if asteroid 1950 DA smashed into the Atlantic Ocean about 360 miles (580 km) from the United States, the resulting blast could be equal to a 60,000-megaton explosion, or about 3.75 million times stronger than the nuclear bomb dropped on Hiroshima, causing tsunami waves at least 200 feet high (60 meters) to crash against the East Coast. Unexpectedly, the scientists found 1950 DA is a porous rubble pile, about half of which is empty space. They also discovered that this loose collection of rocks is spinning faster than the forces of gravity or friction would allow it to remain in one piece, which suggests mysterious forces are helping this clump of debris to stick together. "I was expecting to find a high-density metallic asteroid, as such an asteroid wouldn't require cohesive forces to hold itself together under its fast rotation," lead study author Ben Rozitis, an astronomer at the University of Tennessee at Knoxville, told Space.com. "Instead we found the opposite!" • First off, it wouldn't hit the ocean but break up in the atmosphere. They've learned nothing from Tunguska or Chelyabinsk. These are profound examples of electrical breakup and resistance of the atmosphere. But they don't whatsoever heed this. • Second: It probably isn't a rubble pile. Imaging of the body of 1950DA doesn't indicate a lumpy, rubbly, "pile." They are assuming something that doesn't exist in actuality. Its appearance is smooth as well--not something that would indicate a thrown together body of gravel or rubble. To assume it is suddenly rubbly and loose and gravelly inside is a red herring based upon their belief system about mass. For example, pumice is very light/low mass. But it's not a piece of rubble. • Thirdly, and perhaps most ironically, mainstream science--whose ethos is supposedly couched in the scientific method--enjoys flagrantly abandoning this method whenever it wants to. The establishment must always be on the ready to invent a "mysterious force" that can be explained away to keep their theories--and then call the mysterious force something--and then declare this mystery force to be a reality. • Fourth, direct observation indicates the asteroid is obviously being held together just fine. No mysterious force is necessary. 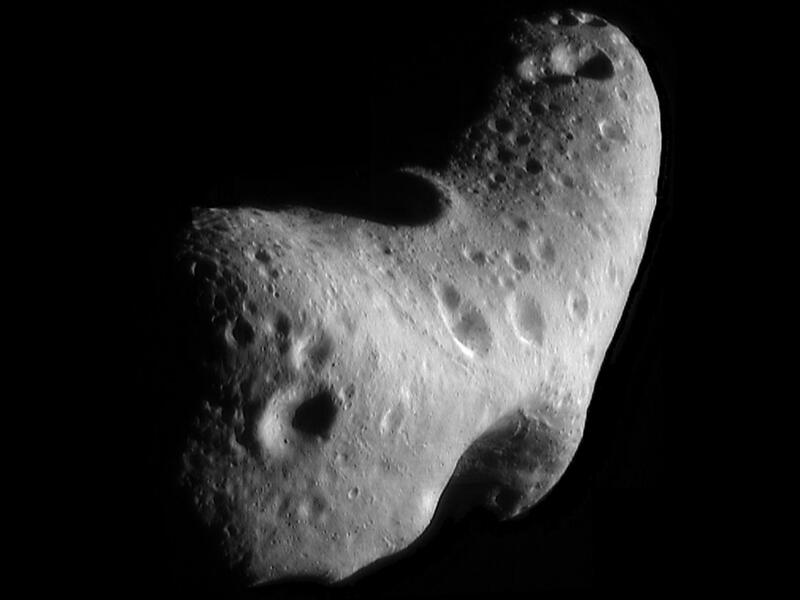 What is baffling is their flawed theory and assumption of what asteroids "should be" made of versus their structural integrity under fast rotation. But they are over-thinking things in my opinion. Something will not fly apart if it is of low density and spinning fast. For example a big fluffy piece of cotton candy can be sent rotating in outer space very rapidly and it will not fly apart. It will remain intact because in space there is no resistance. Yet, per the press release, this rationale is not in their thinking. Also, a lower mass object will have less mass to fling around and will be less likely to "tear itself apart" if that is what they insist must happen. • If anything, per the "spinning ice skater" idea, the faster something draws itself into itself the more likely it will spin faster and stay together. But this doesn't occur to them. • I hope those here mentioning possible "dark matter halos" are joking. I think they will come to a new realization though. Not just our solar system, even asteroids are surrounded by dark matter halos. Each Planet as well. And atoms as well, a dark halo for them too. Current is only the acceleration of electrons due to the massive gravitational forces of dark halos around atoms. I think I just united the 4 forces, Nobel please. I thought I layed this on pretty thick, but in case you couldn't tell, yeah its sarcasm. It'd be great if someone who has a copy of the Icarus paper would send it to me. These Science Daily articles (and others) are so grossly non-technical!! Funny, their paper says nothing of the insanely unlikely chance of such a collision. "Infinite Improbability," if you will. I think I see a crater chain. This rock has been abused. But don't think those could all be impact craters. Seeing the image of Vesta gave me another idea about cratering. I'll need to write and draw it up. Suffice it to say, I don't think all craters form from the same processes.